300WH Whole House Bacteriostatic Unit connects directly to your main water supply line going into your home, providing filtered water for your entire house! 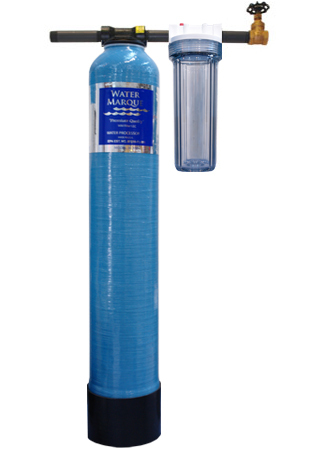 This commercial grade water treatment unit is designed for municipally treated water. It features state-of-the-art engineering and design and has surpassed the most rigorous and demanding quality assurance testing. Capacity : 1 Year or 75,000 gallons under normal use. Media : KDF/Granular Activated Carbon. Includes: Filter Tank, Pre-Filter Housing with (1) 5-Micron Pre-Filter, Spanner Wrench, and Mounting Bracket. 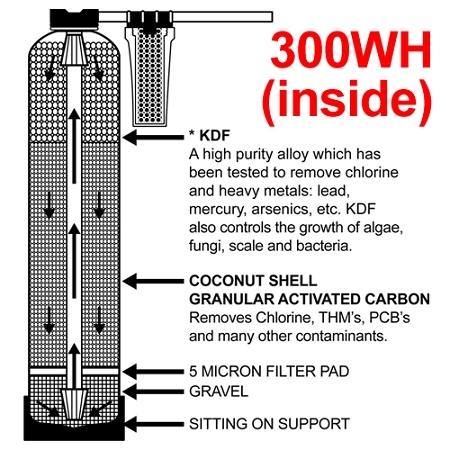 We purchased the 300WH filter and had it installed last week. I've noticed that our water does not have an odor anymore and it does not have an aftertaste either. Our water was good water before the filter, but I've become more 'chemical / toxins' conscious and wanted to take out as much extra stuff out of our water as possible. The instructions say the tank needs to be installed standing up and we were fortunate enough to be able to install it under the house without digging a whole. We read the reviews and saw that we needed a plumber to install the tank and that we should put turnoff valves before and after the tank. We built the pipe around it so that in the event something happens, we can still have water to the whole house by using some turnoff valves. Hope this helps!